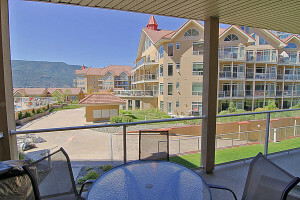 This 4th floor,1 bedroom, 1 bathroom suite features Street and Partial Mountain views from the deck. This suite provides a Queen Bed in the bedroom, a Queen sofa bed in the living room and a main bathroom. It is equipped to accommodate 2 guests (3 if one guest is on the living room sofa bed). There are TV’s in the living room and bedroom with cable service and high speed Wi-Fi (internet). 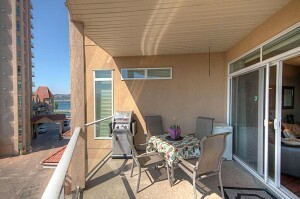 This fully equipped suite comes with kitchen dining for 3 including a blender, toaster, coffee maker, bath towels, bed linens, an in-suite washer/dryer with laundry detergent and a gas BBQ on the deck. Within the secured, undercover building parkade you will find a reserved SINGLE car space. 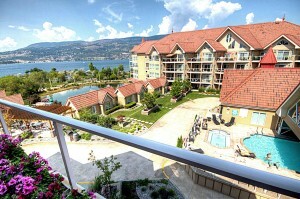 Very affordable 1 suite with BBQ on deck, Cable and Free Wi-Fi internet included - easy access to outdoor pool.